When St Bartholomew’s Primary School was located on School Lane, they did not have their own playing fields, but used the adjacent Stafford Orchard Park. 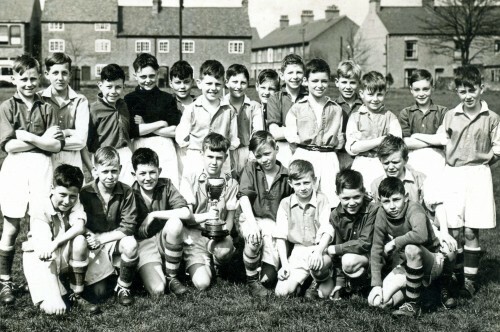 This photograph of the school football team was taken on Stafford Orchard in about 1955. Back row, left to right: Unidentified teacher, ?, ?, ?, ?, ?, John Stirling, John Commons, Keith Perkins, ?, John Pestall, ?, Chris Sharp, ?, ?. Front row, left to right: Tony Noon, ?, ?, Ray Golding, ?,Graham Pervin, ?,Stuart Beaver, Trevor Newton (at the back of Stuart Beaver). Missing information: Can you provide the missing names and/or a more accurate date?